I was working on a birth announcement to send to some relatives who aren't online. These are just some pictures I took here at home. I've used Snapfish before and I like the convenience of having them printed off at the Walgreens just down the road but I'm wondering though if anyone here would recommend another service? Thanks! Also, did you see the beautiful pictures of Robina's family? How blessed to have a such a talented friend! I'm planning to use Shutterfly because I can put all the addresses of people to send announcements to and just have to pay for the postage and they'll send them out for me, so I don't have to worry about addressing them and sending them out. I think Snapfish probably does the same thing though. OK, I like Wal-mart and Sam's club, way, way cheaper and just as fast. Wow, I want Robina's friend too. Oh Charlotte, she's a doll baby. I'd get nothing done... I love the rings on the toes. we have a few of those from Matthew's photo time. So so sweet. Kiss her for me! It was remembering those beautiful pictures of your Matthew that inspired me to take that picture! When it comes to Birth Announcements, Christmas Cards, etc, Costco has always worked the best for us. I've never tried Walgreens. Shutterfly...they never disappoint. You can store pics with them forever ;) and p/up certain orders through them at Target. Blessings and wecome to your dear one! sent you an email. but to put links here for others I use one of these services which are very cheap for custom design and then print at winkflash. so glad you liked the pictures. 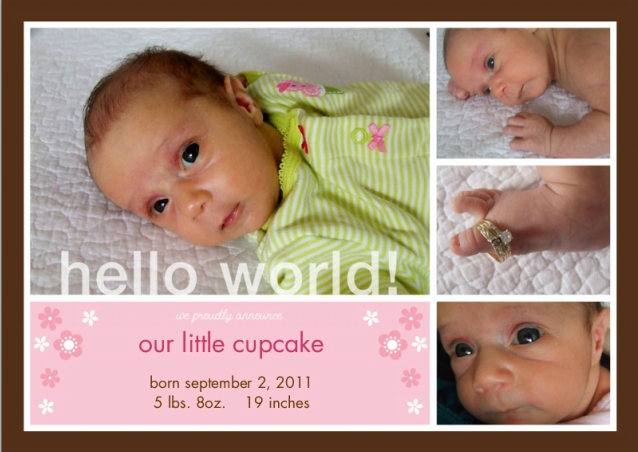 my friend is so sweet to give us these pics as a baby gift.